There are no two ways about it; planning almost any wedding is a big deal—a vast undertaking requiring time, energy, organization, creativity, and lots and lots of patience. And that makes sense. For many people, it’s the biggest day of their lives as they set their course for the future and embark on the incredible journey of marriage. And yet it’s more than just an event packed with meaning. It’s often a huge production (no matter the size of the guest list) packed with details large and small, and often with more moving parts than a Swiss watch. Pulling off a successful wedding, while it may be a labor of love for the full-of-heart, is most definitely not a task to be undertaken by the faint-of-heart. That’s why a skilled, knowledgeable, enthusiastic, and above all, professional planner is as indispensable a part of a wedding as the couple themselves. And when it comes to planning a Vegas wedding, the need for a highly knowledgeable, professional planner becomes all the more obvious. Nowhere else has Vegas’ truly unending array of options and amenities, and navigating such a vast sea of possibilities requires an insider-knowledge base few of us mere mortals can even begin to grasp. So we decided to take up a little bit of the valuable time of several of Vegas’ busiest professional wedding planners to get a few of their stories and learn some of their own insider tips on how to ensure that your Vegas wedding is everything you want it to be, and that it goes off without a hitch. No pun intended. Insider Tip #1: Manage your guest list! So says Tara Federico, Designer and Planner for the Vegas area wedding and event design company, Scheme. Tara explains that Vegas wedding invitations often have a higher “yes” response rate than the typical wedding invitation (everyone loves an excuse to visit Vegas!) so it’s important to have a good grasp on the size of your party. Knowing this will help you and your planner begin to pare down the list of options to just the ones that suit your needs. And Tara should know. Scheme has been putting together uniquely stylish weddings and events in Vegas since 2010 and has been featured in numerous industry publications. 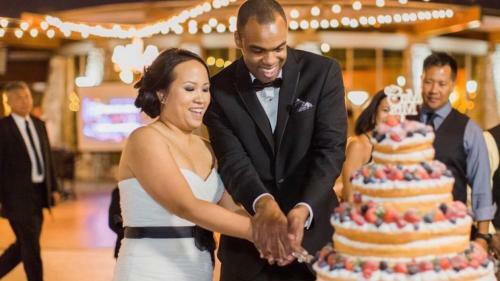 And in that time they’ve pretty much seen and done it all, from glamorous lakefront and sophisticated theater weddings to the surprise birthday/engagement/instant-wedding party they managed to pull off with just a few weeks of planning. Events like this can only happen in Vegas and only do happen with the help of creative professionals like Tara and Scheme. Insider Tip #2: Think outside the box! Stephanie Case of Lush Event Productions strongly recommends thinking outside the Vegas box to find your best deals without sacrificing. This can mean thinking off-season. Of course, any time of year is a good time to be here, but when the crowds get a little thinner, availability tends to go up and prices tend to go down. Stephanie also recommends thinking off The Strip. Of course we all know about the glitz and excitement of The Strip, but Vegas is also home to a myriad of venues and possibilities off The Strip as well—both nearby and farther away. 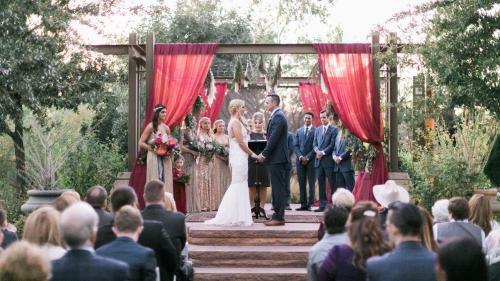 Most guests will get a certain image in their heads when they think “Vegas wedding,” so why not surprise them with something off The Strip and maybe, say, out in the natural beauty of the surrounding area (Red Rock Canyon, even the Hoover Dam and the Grand Canyon are within range from here). Or maybe try one of Vegas’ numerous properties just off The Strip but still very nearby. Lush Event Productions is a beginning-to-end planning company offering a variety of planning packages, in-season and off-season, on The Strip and off. They are adept at suiting a wide breadth of budgetary needs and event types and reminding us why truly professional planning services are an invaluable commodity in this town. Insider Tip #3: Use your imagination and use your time wisely! Insider Tip #4: Take time to smell the flowers! Perhaps more important than anything else is the need to take a step back and enjoy the process of planning your wedding, as much as possible. This is advice directly from Emily herself, of Weddings By Emily. Planning your wedding is much more than a major undertaking, it’s supposed to be a joyous and exciting project as well. So when all the daydreaming and details begin to overwhelm (which they often do) step back, take a deep breath and remember to enjoy this once-in-a-lifetime occasion. Of course having a professional planner on your side is key to being able to breath easily. Emily’s experience working with brides even over long distances has taught her the value of going all-out for her clients and taking the bulk of the worry upon herself, allowing her clients to relax and enjoy their special day—as well as all the potentially stressful days leading up to it! Emily’s focus is on fun and creating lasting relationships with her clients. So, know your list, think outside the box, don’t be shy and have a good time—all sound, inside advice from some of Vegas’ top wedding planning authorities. With so many options and so many possibilities it’s hard to go wrong with a Vegas wedding. But if you want to be 100% certain it all goes right, follow the advice above, follow your heart, and for goodness sake, get yourself a good planner!